Visit two UNESCO Heritage Sites, Toledo and Segovia in one day, on this comprehensive tour with access to the Alcazar of Segovia and the Cathedral of Toledo included in your ticket price. Enjoy two stunning cities in one day on this comprehensive tour of Toledo and Segovia. Both Toledo and Segovia are must-do stops on any travellers visit to Madrid – two ancient, contrasting cities which due to their beauty and rich history have both achieved UNESCO World Heritage Site classification. The history of both cities fits together perfectly – on this tour your expert guide will use the array of stunning monuments and ancient buildings to help you trace the history of Spain and the Iberian Peninsular from Roman times, through to the Christian, Muslim and Jewish on the region, and the modern day. Departing from central Madrid via bus, your Segovia tour will begin in the city’s Old town, passing through the narrow streets and pausing to admire the Roman Aqueduct. 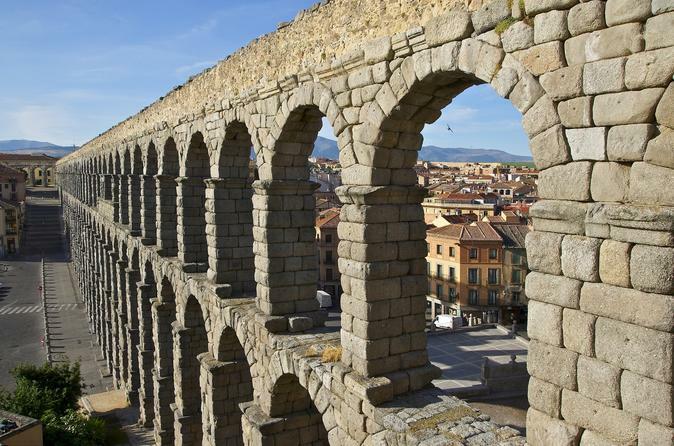 The aqueduct of Segovia is considered the most important work of Roman engineering in Spain – incredibly well-conserved, it will have you gasping and reaching for your camera. You will then enter the city’s ancient fortress, the Alcázar of Segovia, with your entry tickets and guided tour inside included. After a break for lunch, the tour will then progress to Toledo, where you will explore the city’s medieval neighbourhoods and historic monuments, and come to understand why it is called the City of the Three Cultures (Christian, Jewish and Muslim). Your guide will take you into the city’s principal attraction - Cathedral of Toledo (if you select this option), and after you tour inside and explore the city further, whisk you back to Central Madrid.